Made by Holsman Automobile Co in Chicago, Illinois, United States of America, 1908. This 1908 Holsman auto buggy is a high wheel runabout built by the Holsman Automobile Co. of Chicago, Illinois. 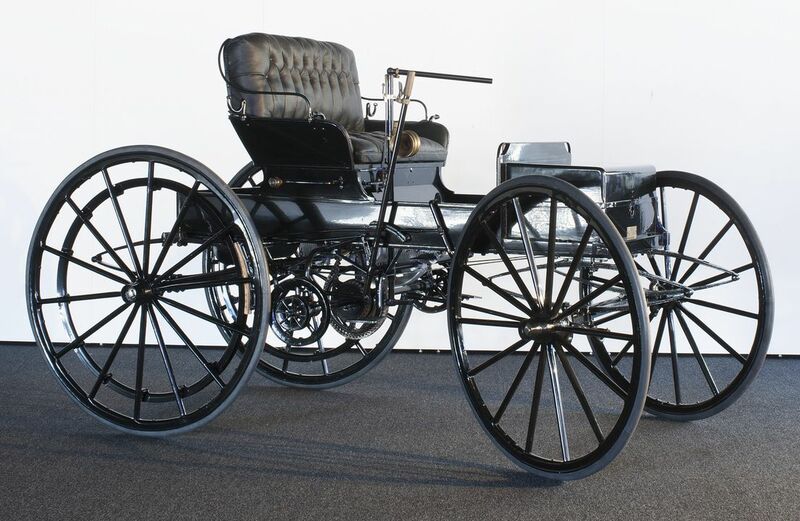 It is little more than a horsedrawn buggy powered by a small centrally-mounted petrol engine. High wheeler cars evolved in the mid-West of America in the first decade of the twentieth century and show the transition from the horsedrawn vehicle to motor vehicle. The Holsman auto buggy features a simple 2-seat piano box type body set high off the ground on four, large diameter buggy wheels. The chassis is made of wood with flat steel bracing. The mono bloc engine is a twin-cylinder, air-cooled model with horizontally-opposed cylinders, located under the seat. There are full elliptic springs front and rear. Steering is by a vertical tiller, and the throttle is operated by twisting the tiller. Starting is by handle which projects from under the front seat. There is a tool and luggage box above the front axle, and a picnic basket holder at the rear. The transmission comprises a moveable power shaft suspended on hangers by roller bearings which revolve in a forward direction. The shaft has two, deep grooved pulleys at each end, the larger one for engaging a flexible, steel transmission chain of ¼ inch (0.635 cm) standard link taped with cloth friction tape or cotton webbing. Power was transmitted via a pulley attached to the spokes of both rear wheels. A smaller pulley engaged the wheels for reverse motion. The large timber wheels have slender spokes, small hubs, narrow felloes and solid rubber tyres. The brakes act directly on the tyres. The 6-inch (15.24 cm) wide mudguards are made of a standard buggy iron frame, flat oval in shape, and covered with patent leather. The body is finished in black with red pin striping and is now fitted with brass side lamps and a carriage step. Brass plaque screwed to front reads 'HOLSMAN AUTOMOBILE Co. / CHICAGO USA / No. 2491V / PATENTED APR. 15 '02 / OTHER PATENET PNDING'. Brass plaue on the wooden box that encloses part of the cars transmission reads 'THE / Duplex coil PAT. JUNE 27 1905'. Eved text on the brass plaque on the outside of the luggage box reads 'LARKE HOSKINS & Co LTD / AGENTS / SYDNEY'. The Holsman Automobile Co. established by Henry Holsman, a Chicago architect, went into production in 1903 with high-wheeler vehicles driven by horizontally-opposed engines of 5 hp. This was increased to 7 hp in 1904 and 10 hp from 1905 to 1909. In 1910 the Holsman had a twin-cylinder engine rated at 12 hp and a 26 hp 4-cylinder model. The first Holsman had a final drive of 7/8 inch (2.22 cm) manila rope which slipped badly in the wet. This was replaced with a braided chain of manila and steel wire and later a standard chain. The front wheels remained 44 inches (112 cm) in diameter with solid rubber tyres throughout the entire production period from 1903 until 1910. A two-seat piano box style body was used though a 4-seat surrey was added in 1905, a closed gentleman's coupe in 1909 and by 1910 several delivery wagons. Each vehicle was fitted with dry batteries, a duplicate set of spark plugs, a tool set, one US gallon (3.8 litres) of cylinder oil, fenders, rubber foot mating, horn and two brass kerosene lamps. The cars were finished in black or Brewster green with red fine lining while the engine was painted with aluminium paint. Total production comprised 6348 vehicles and the most successful year was 1906 with 1473 cars. The firm went into receivership in 1910. Georgano, N. "The Beaulieu Encyclopaedia of the Automobile", The Stationery Office, London, 2000. Nothing is known about the early history of the vehicle. It was seen by Museum staff illustrated in "The Sydney Morning Herald" on 27 October 1936 participating in a National Road Safety Week procession through Sydney's streets which the reporter was erroneously described as a "steam buggy the forerunner of the motor car, which reached Sydney in 1896". The procession included 60 motor cars driven by men and women with "exemplary records" as safe drivers together with a Roman chariot, mail coach, horse bus, Hansom cab, bicycles, early fire appliances, horse-drawn brewery wagons and the latest Sydney double deck bus. The Road Safety Week was organised by the Commissioner of Road Transport and Tramways and opened by the Minister for Transport to increase safety awareness amongst all road users at the time including drivers of cars, lorries, bicycles, trams, buses as well as pedestrians. In addition to the procession, special road safety certificates were presented, 250 Yellow Cabs of Australia taxi drivers pledged to drive safely, a competition was held for the Department of Road Transport and Tramways' ambulance corps, and a Road Safety Week ball was held in aid of the Central District Ambulance Service. Also being discussed at this time in State parliament was compulsory third party insurance of cars, increased police for patrol work and a speed limit on the roads, while optometrists were discussing the need for eye testing for licence applicants. The Museum contacted the owner of the Holsman auto buggy, Mr W.B. Larke, of Larke, Neave & Carter Ltd, (later LNC Industries) an early New South Wales importing group which was established in 1924 to handle the importation of Chrysler automobiles. William and Fred Larke had begun by selling Red Star bicycles in 1901. They went on to import a number of motor vehicles including the Bean and were joined by Norton Neave. Their original offices were in Hunter Street, Sydney, but by 1936 they had a showroom at 177-185 William Street and were the metropolitan distributors for Chevrolet cars. Once approached, they agreed to donate the car to the Museum. In 1984 the Museum decided to restore the Holman to as-new running condition without re-working the engine except to replace a broken valve. The wheels and king pins were rebuilt, the upholstery replaced, and the vehicle repainted and pin striped. "The Sydney Morning Herald" 27 October 1936, 28 October 1936.